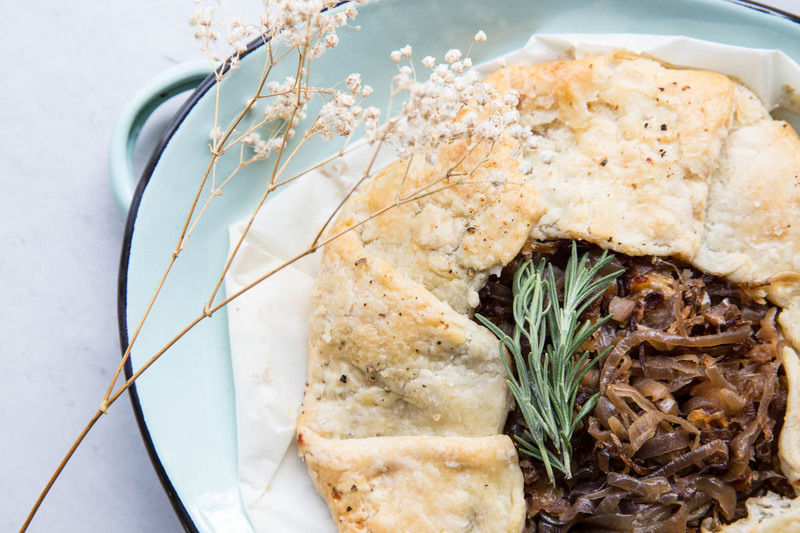 This caramelized onion galette (or rustic tart) may just be the best thing that’s ever happened to an onion. It’s all of the sweetness that is so loved in French onion soup but wrapped up in flaky pie dough. This month’s Eat Seasonal Guide had the illustration of an onion so I knew I had to put on my thinking cap and get some creative juices going with onions this month. 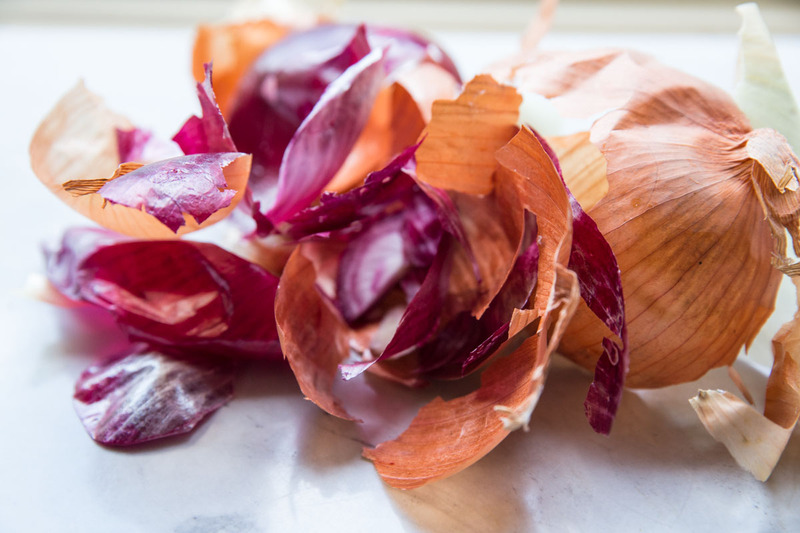 Though I don’t usually think of onions as seasonal, they really are and if you see them in the farmers market now, it’s definitely the best time to get them flavor wise. Pick up a few and make something that really highlights the onion for once! We all use onions in our everyday cooking but how rarely do we use them as the main ingredient of a dish?! Not often enough. • Heat up a skillet (don’t use non stick for this) to medium high before you add the onions in and don’t add oil. • Let them cook and brown for at least 4-6 minutes before stirring them. You want them to stick to the pan a little before you push them around. Once they start browning, then you can stir with a wooden spoon occasionally. • Add a little butter and a touch of sugar to enhance the caramelization (not necessary but it does boost the flavor and texture). • I use homemade pie crust because I find it’s easier to work with than store bought and tastes better. You can find my recipe here. • Let the galette sit in the fridge for 30 minutes before baking to ensure that the crust will be flaky. • Brush the crust with an egg wash and dust with sea salt and freshly ground pepper before baking. This gives every bite of crust even more flavor. • Gruyere cheese is my favorite for this galette but you can also use white cheddar if you’re in a pinch. 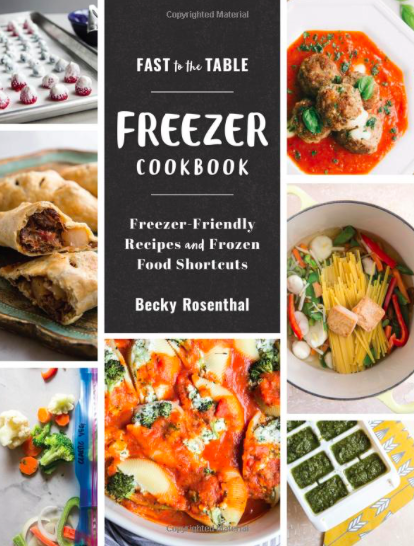 Here are some more fun seasonal recipes to take advantage of all the fresh produce out right now! 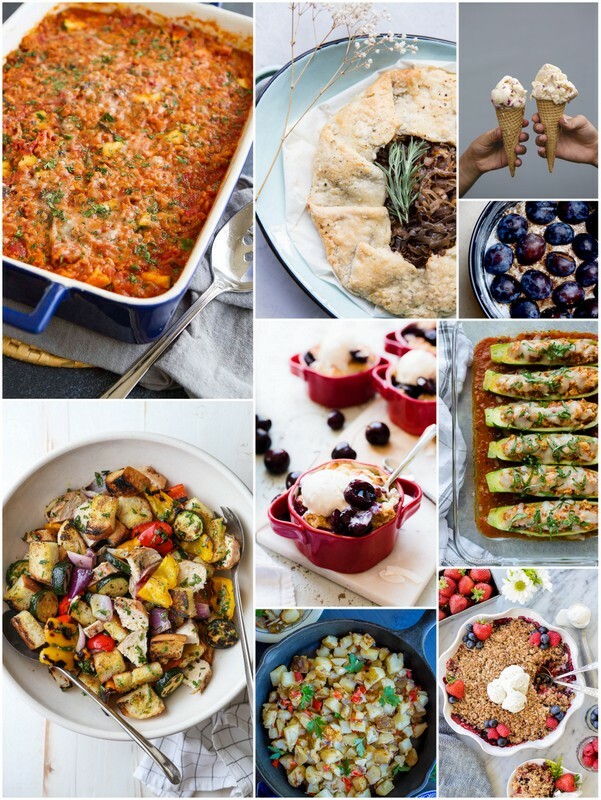 If you make one or if you’re making something else with a seasonal ingredient, make sure to tag #eatseasonal on instagram so we can all share the fresh inspiration! 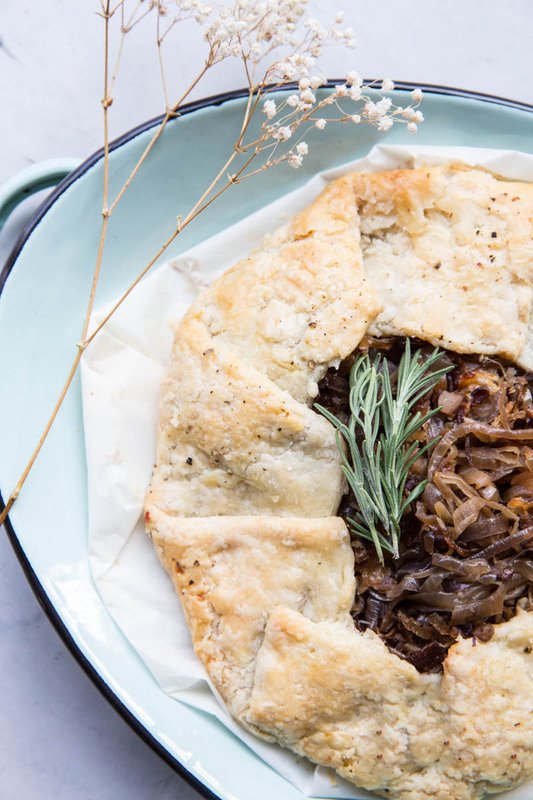 This savory Caramelized Onion Galette is great for an appetizer or meatless dinner! Heat up a large heavy bottom skillet over high heat (don't use non-stick here unless that's all you have). Add the thinly sliced onions and turn heat down to medium high. Let cook for 3-4 minutes then start to stir using a wooden spoon. You want to wait until they start sticking to the bottom of the pan and getting brown so if you start stirring and they're not to that point yet, let them keep cooking for an extra 2 minutes. Use the wooden spoon to scrape up any browning form the bottom of the pan and stir occasionally for 3-4 more minutes. 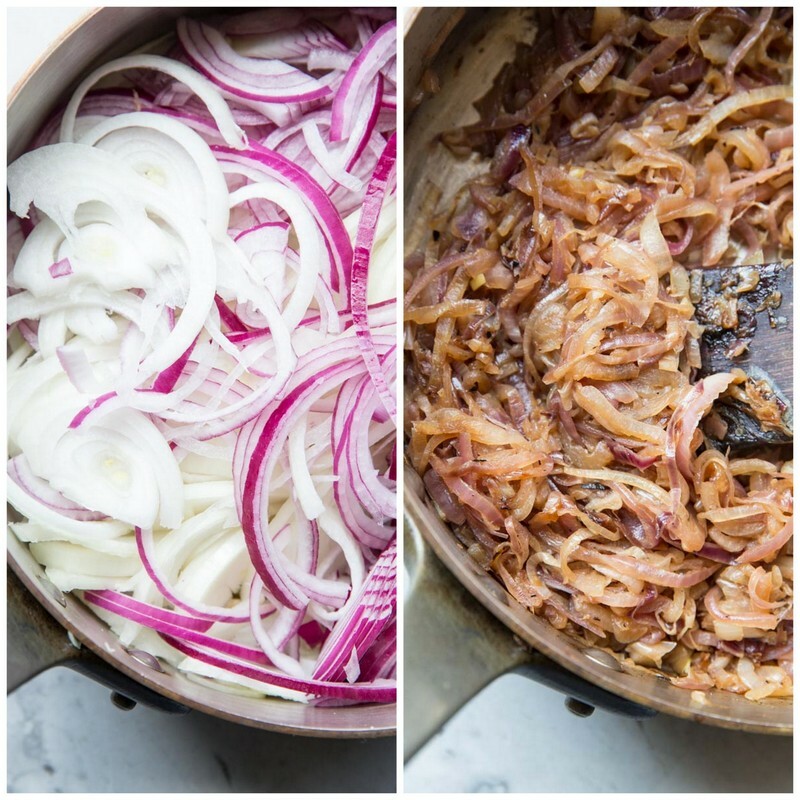 Grate the gruyere cheese and toss with the caramelized onions. Roll out the pie crust to a large circle. Spoon out the onion and cheese mixture to the center of the pie crust, piled high. Fold the edges of the crust up onto the onions. Place prepped galette in the refrigerator for 30 minutes. Brush a whisked egg over the edges of the crust (you don't need much but this will make the crust golden brown. Sprinkle the crust with extra sea salt and freshly ground pepper. Bake for 40-50 minutes or until crust is golden brown. Sprinkle finished galette with fresh herbs. Let cool slightly then serve. This can be served with a green salad for a meal or as an appetizer. If you can't find gruyere cheese, white cheddar also works well. 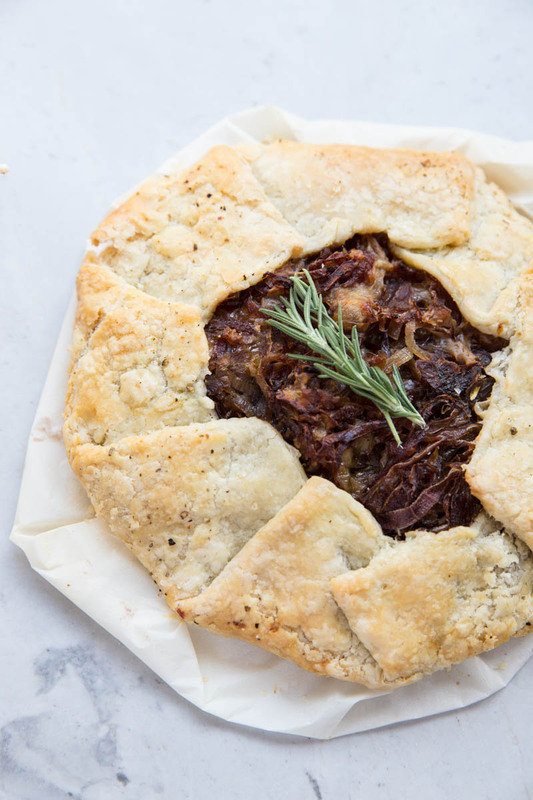 Caramelized onions are magical an this galette does look like the best thing to happen to an onion! 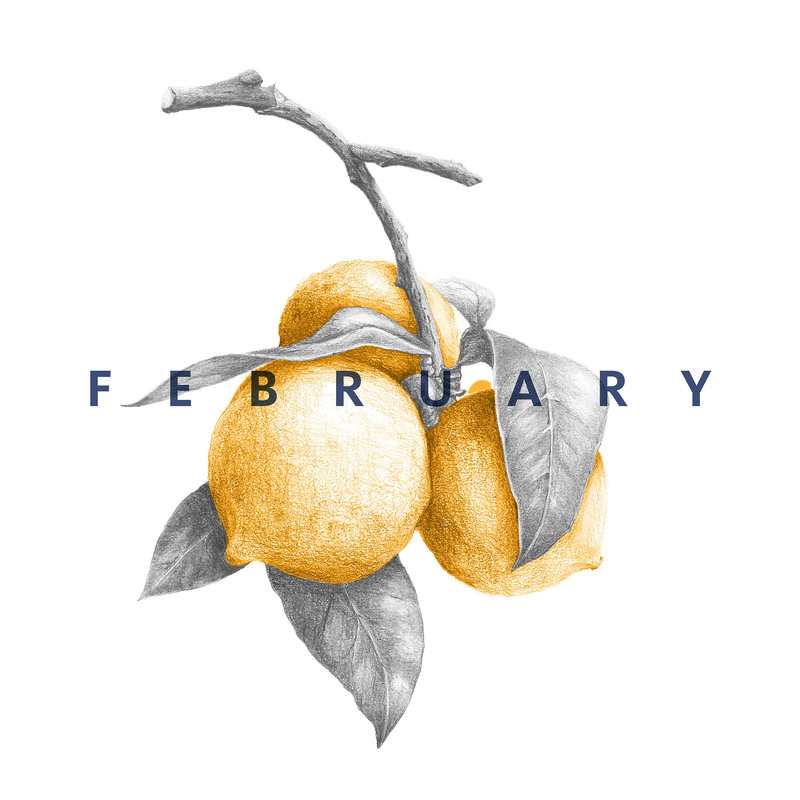 This is just gorgeous Becky, and thank you for hosting another amazing month! This looks fabulous Becky! 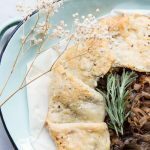 Love me a savory galette, and caramelized onions–love them even more! This one is definitely magical! Hope you’re having a great trip! Love your tip about getting them brown before adding butter to the pan. I’ll have to try that one. i love onions so this sounds magical! thanks, also, for the tips on caramelizing onions and letting the galette dough rest for maximum flakiness. YES, maximum flakiness is so important 🙂 Thanks for stopping by the blog Kate! That crust looks so flaky and delicious!! For some reason I can never get caramelized onions right, but I this tart is making me want to get some practice! Looks delicious!